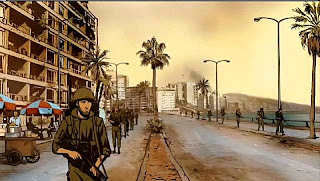 Like an animated hallucinatory pill, "Waltz with Bashir" is a journey of atonement through the memories of its filmmaker during the recent conflicts in the Levant. A "Waking Life" hybrid documentary, Israeli director Ari Folman has a conversation with an old army buddy in which he realises that he's suffering from the fog of war - he doesn't recall his time in the Israeli Defence Forces during the bloody 1982 Lebanon War. The only memory left is a fever dream of swimming at night onto the shores of a devastated Beirut, a startling image of being birthed into battle. The structure is conventional as Ari traces the recollections of his fellow veterans, but the animation by David Polonsky is unconventional for this subject, and allows the imagery to leap beyond simple talking heads or stock footage into dreamscapes of combat and guilt. While truth can be skewed to benefit the plot in animation over firsthand footage, and while it can also appease the personal interests of the storyteller, the look of "Bashir" clearly articulates the banality and madness of this particular war for its participants. At the heart of the film (and filmmaker) is Ari’s remorse over the massacre of Palestinian refugees inside the Sabra and Shatila camps by Christian extremists avenging their assassinated leader. The armed forces of which Folman belonged stood by as the atrocities took place, and his story winds its way down into this moment, stopping to establish what it was like to be 19 and fighting against children with RPG's in guerrilla warfare. A strong offbeat soundtrack of PiL and OMD offers a consistent point/counterpoint to the action, as Ari fluctuates between repressed memories and present day remembrances. While the last third of the film begins to drag as the main focus steps out of the picture to lead up to the terrible moment in recent history, Folman’s occasional gallows of humour and striking visuals carry us through. “Waltz With Bashir” is highly recommended, and an ideal companion to the recent "Persepolis" – animation as a tool for mature cinema. I hope to see a follow-up from the Palestinian perspective soon.